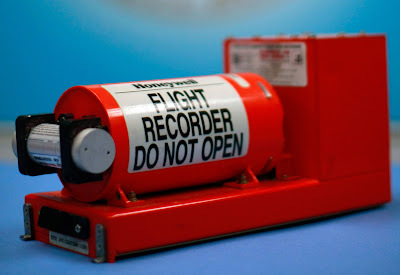 I hadn't seen one of these before, but here's a look at a black box flight data recorder, which as you can see, isn't black. I have one hooked up to the blue tooth in my car. That naturally goes along with the flotation devices you keep under all of the seats; Not to mention the lighted indicators leading to the nearest exits.